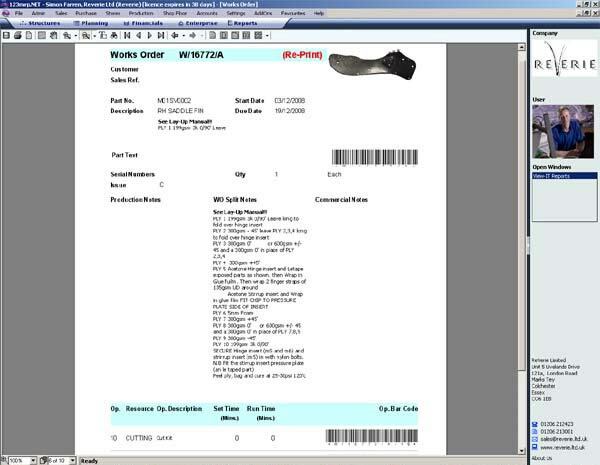 An additional benefit of the MRP system is that it automatically records details of the material used for each part such as batch number, allowing full trace ability at a later date. Throughout the manufacturing process ReVerie’s MRP system allows the tracking of the part through every stage in the factory. Every job is assigned a unique number and barcode and before every process the operator will scan this barcode to inform the system that they have begun that stage. Once the process is finished the MRP system is again informed keeping a close watch on manufacturing times and providing feedback to the sales department to ensure that customers are quoted accurate prices for a job.